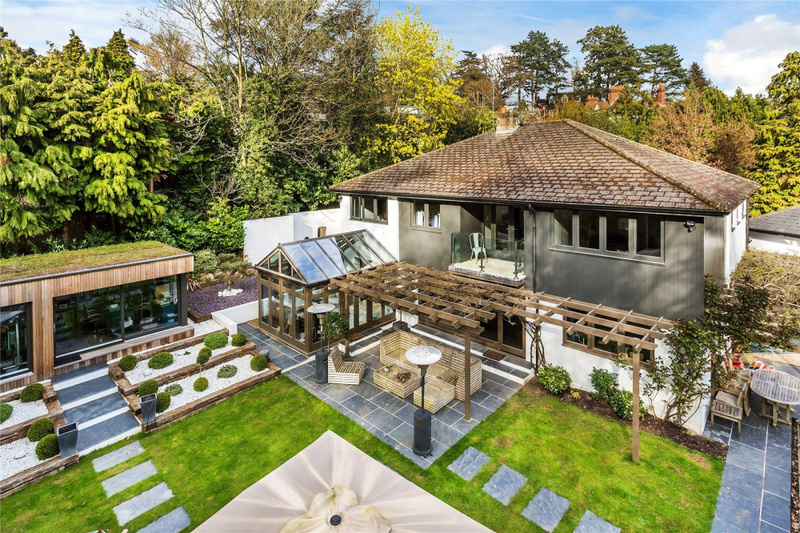 Quietly nestled at the end of a small cul de sac in the heart of Hook Heath this is a truly exceptional home which has been the subject of a meticulous programme of modernisation resulting in a remarkable finish throughout the house as well as the beautiful gardens. 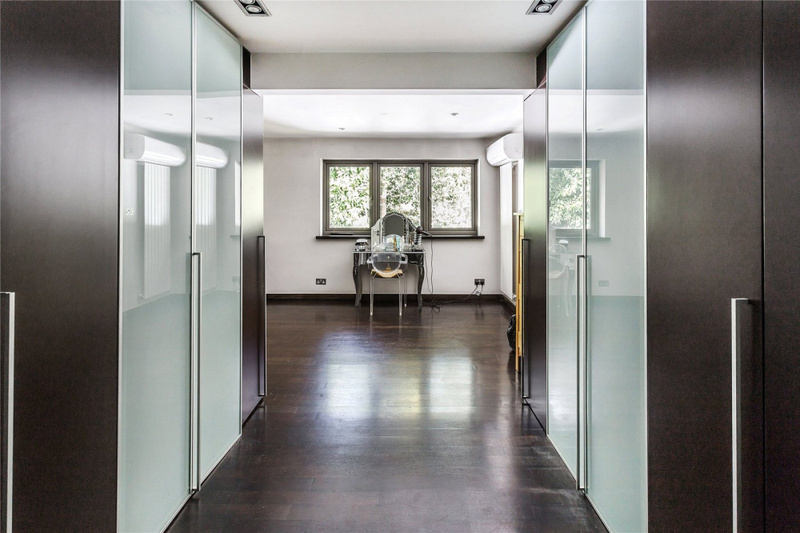 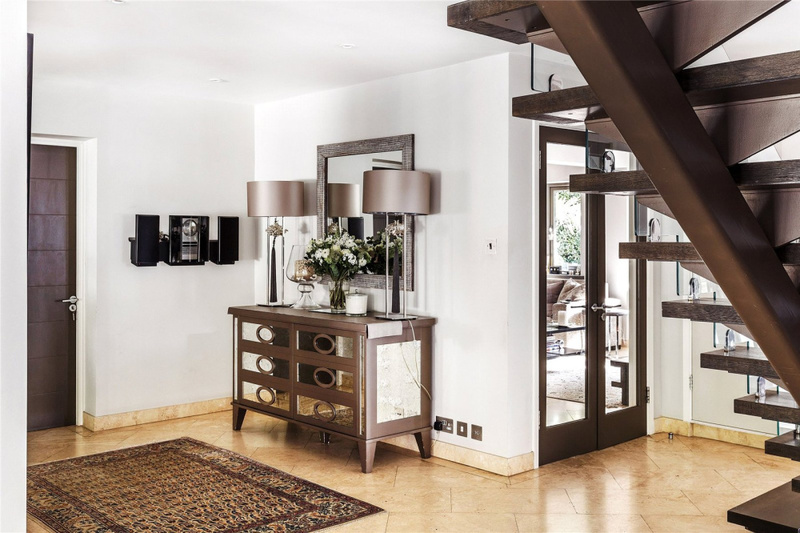 A huge amount of thought and attention to detail has gone into the work that has been carried out, a fact which shines through in almost every corner of the house both in terms of the layout and the quality of the finish. 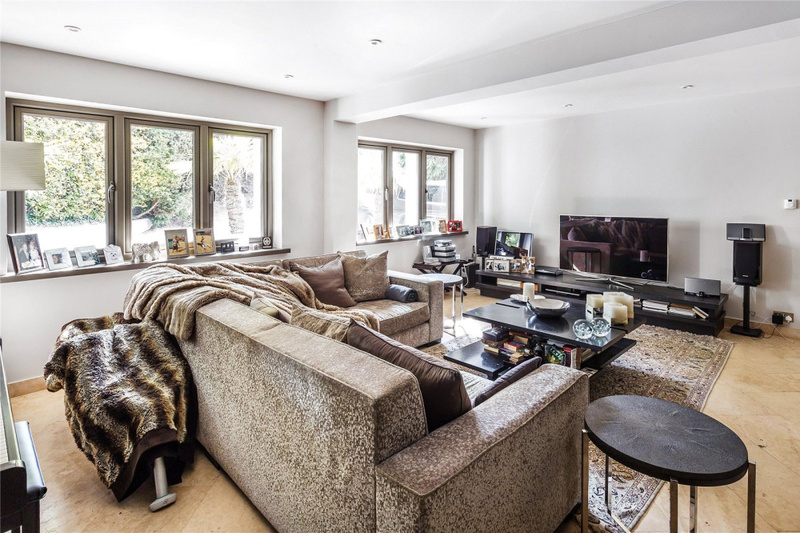 This is a house that works exceptionally well on a number of different levels whether that be for day to day family life or indeed entertaining and which has a perfect blend of open plan and separate living areas which also allows for great deal of versatility to the way in which the accommodation can be used. 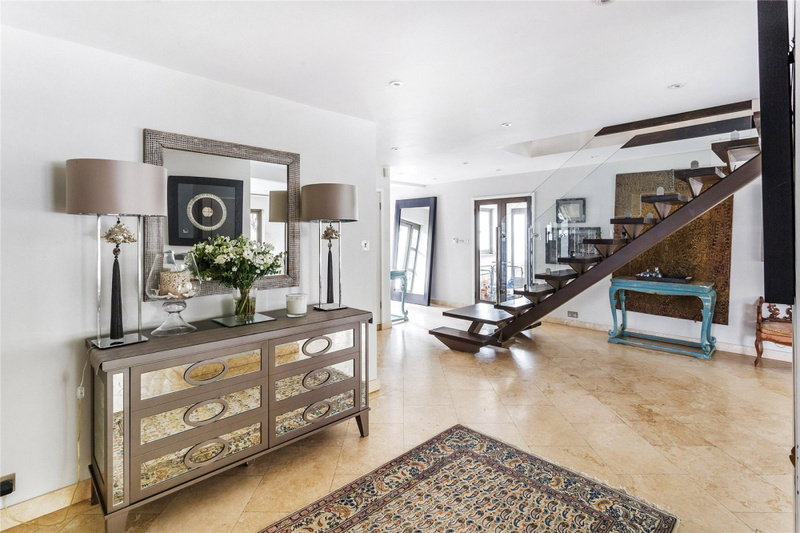 Right from the very start there is a feeling of light and space which runs through the house as a whole that is immediately apparent from the reception hall which looks through a fabulous open tread staircase and on into a substantial open plan living area across the whole of the back of the house. 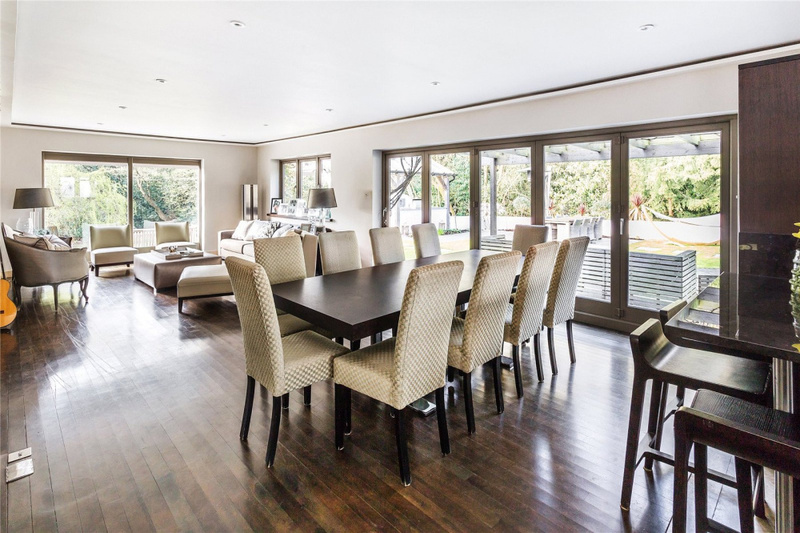 This space is very much open to interpretation in its use, currently a beautifully airy sitting/dining room with exceptional views out over the rear garden and a set of bi-folding doors which lead out onto a large area of decking covered by a vine clad loggia. 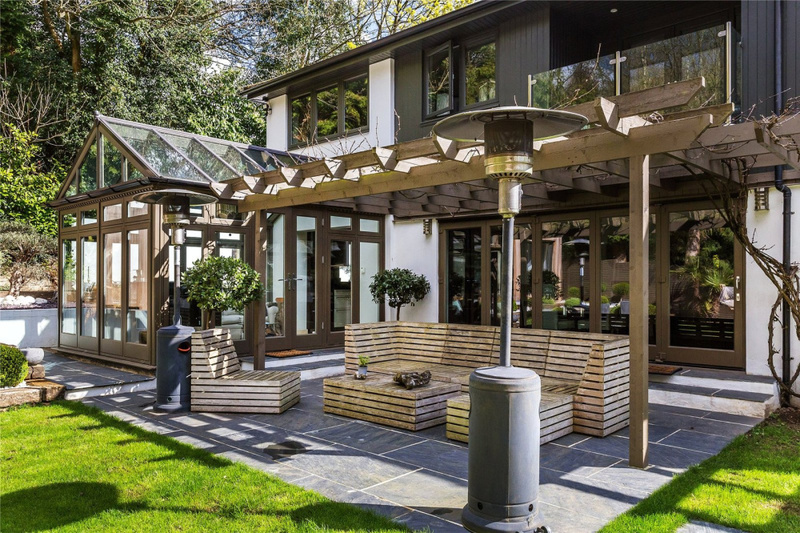 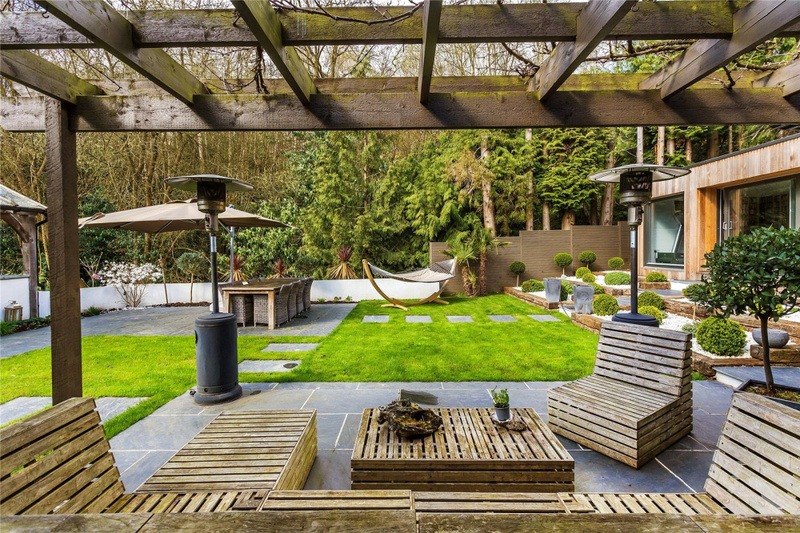 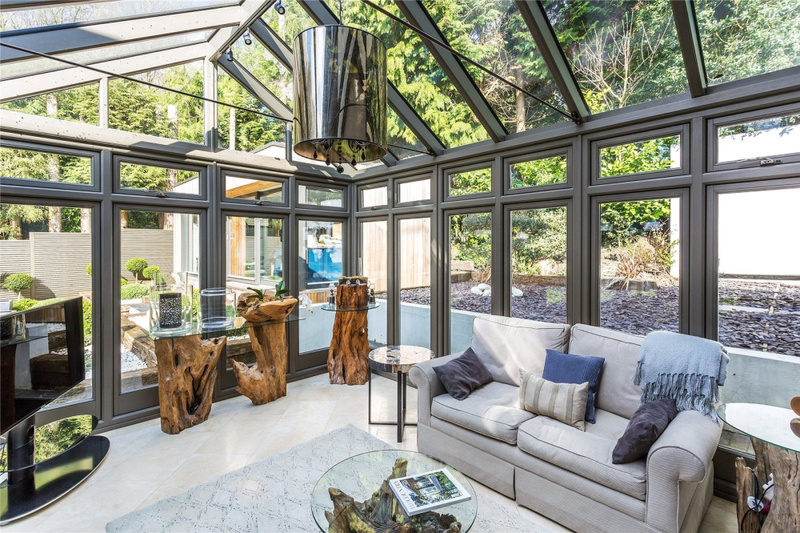 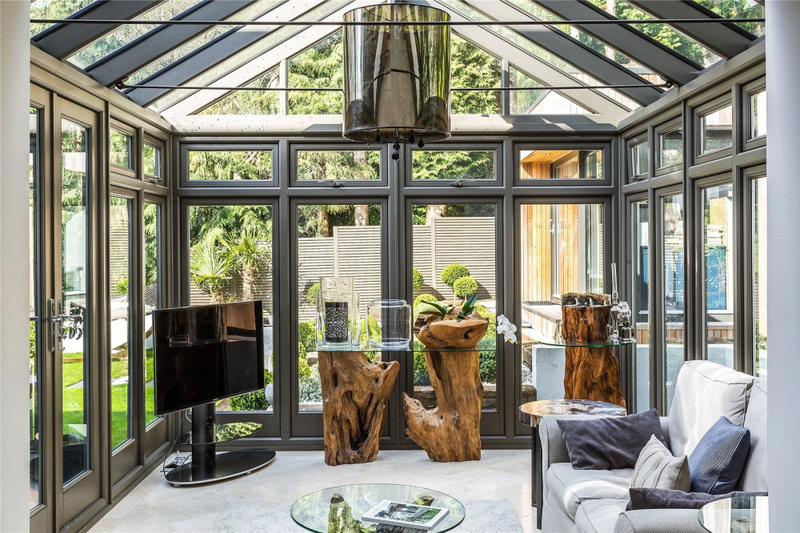 This part of the house works exceptionally well with the garden and during the spring and summer months creates a superb indoor/outdoor space, wonderful for entertaining. 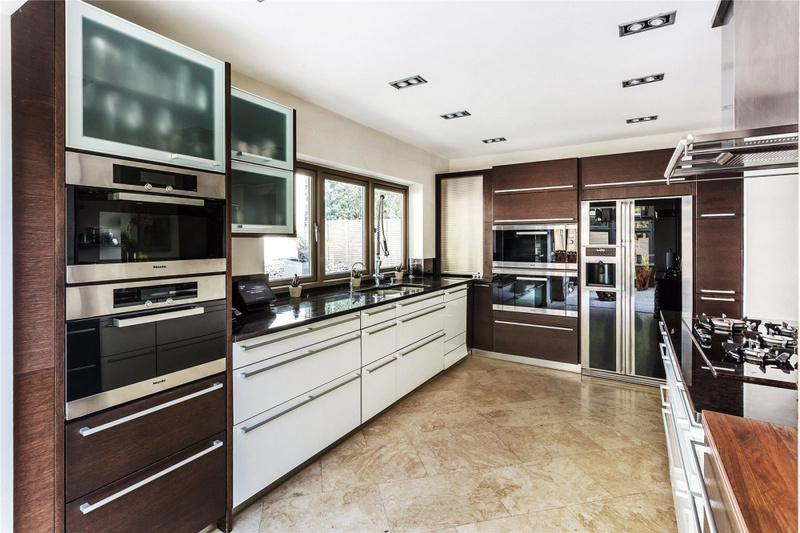 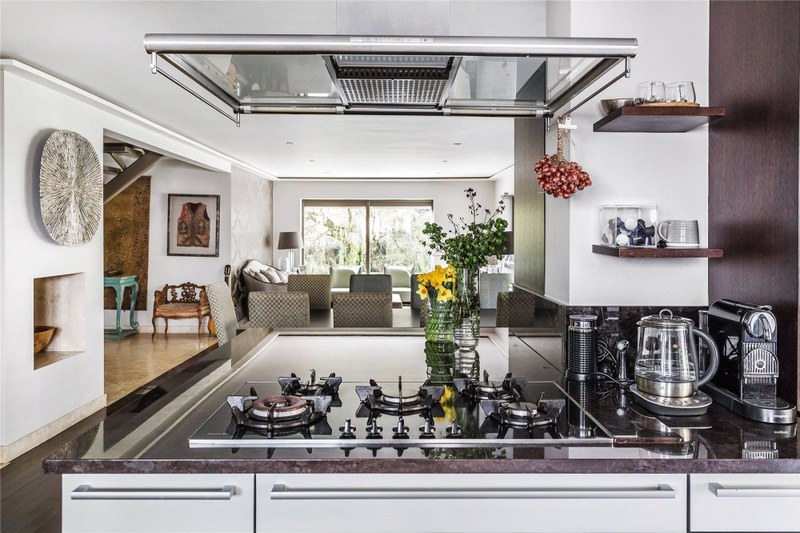 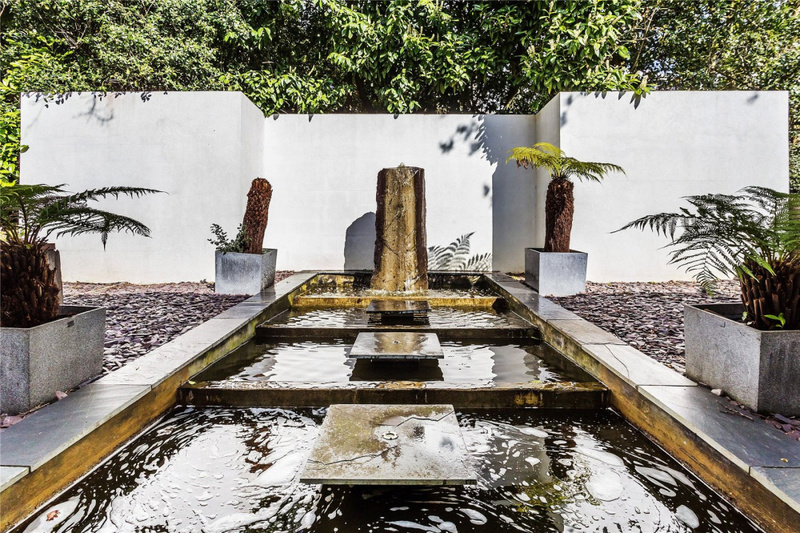 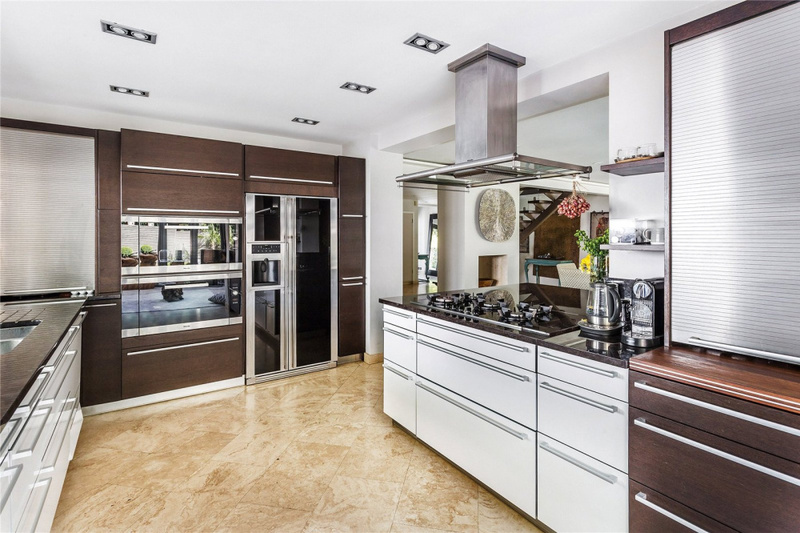 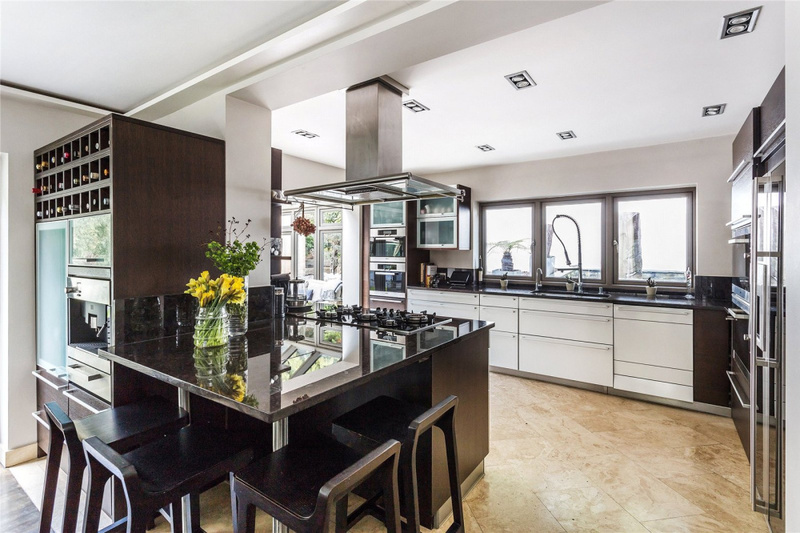 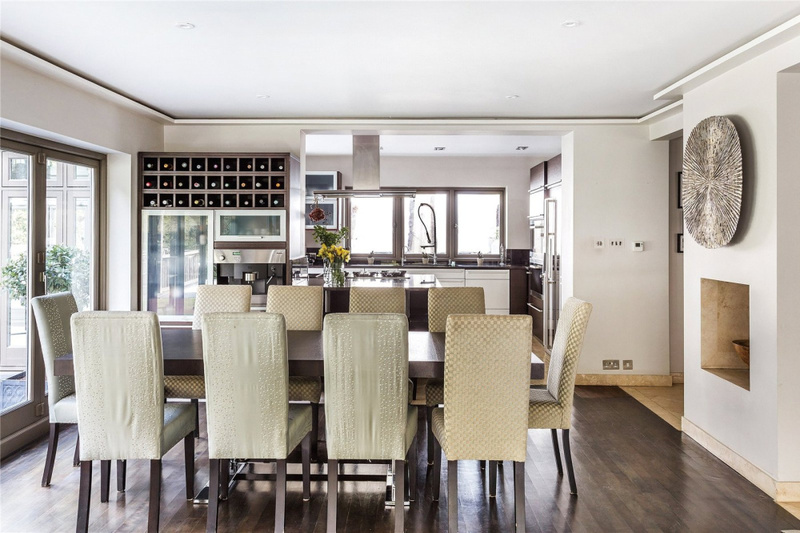 The adjacent kitchen is impeccably fitted out with granite worksurfaces and a combination of high gloss and wood units with a whole range of high end integrated 'Miele' appliances and a wonderful outlook to the side over a small Japanese style garden with cascading water feature. 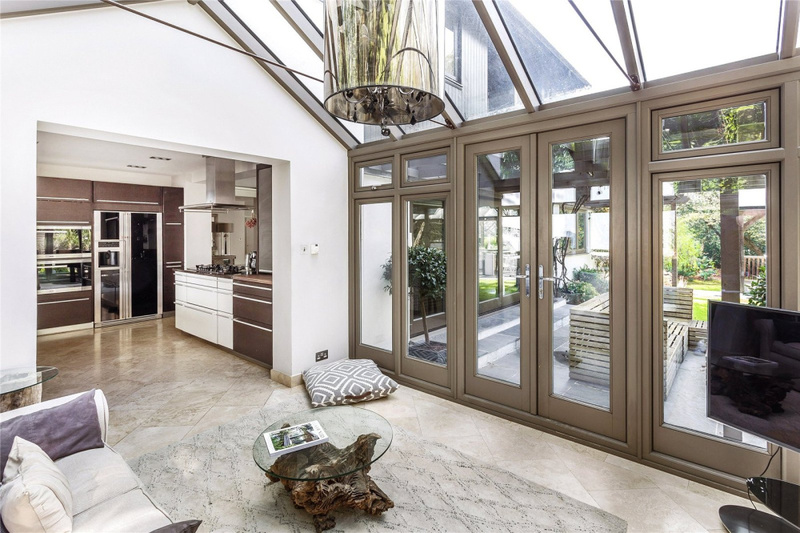 The kitchen also opens into a beautiful conservatory which makes a wonderful place to sit and look out over the garden and which also has double opening doors that lead out onto the deck. 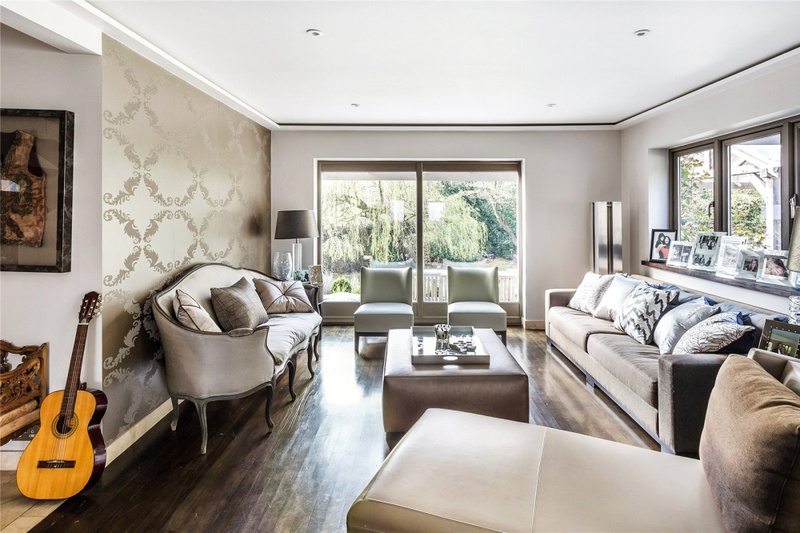 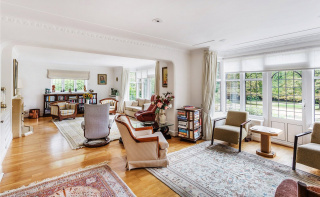 To the front of the house, there is a substantial formal sitting room with a beautifully tiled floor which makes a delightful separate living area. 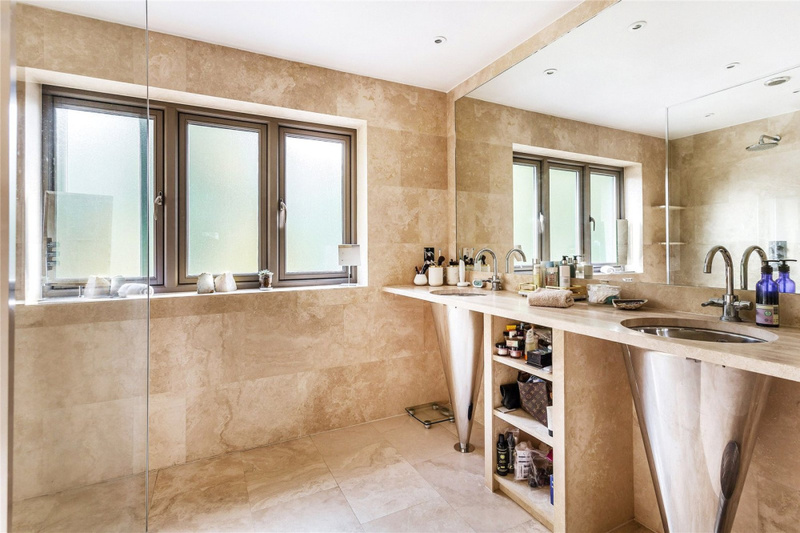 All tiled areas are 'Travertine' marble and have underfloor heating. 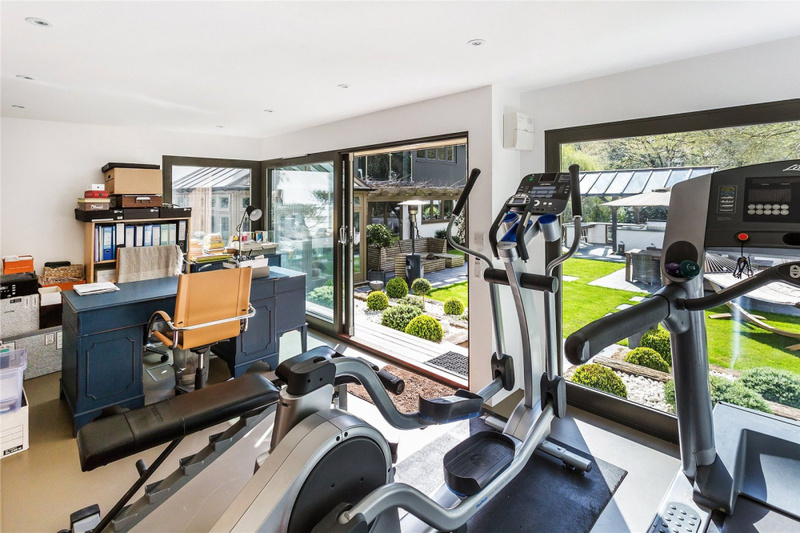 On the other side of the hallway there is a further reception which was formally used as a gym and is currently in the process of being converted in to a downstairs bedroom with en suite shower. 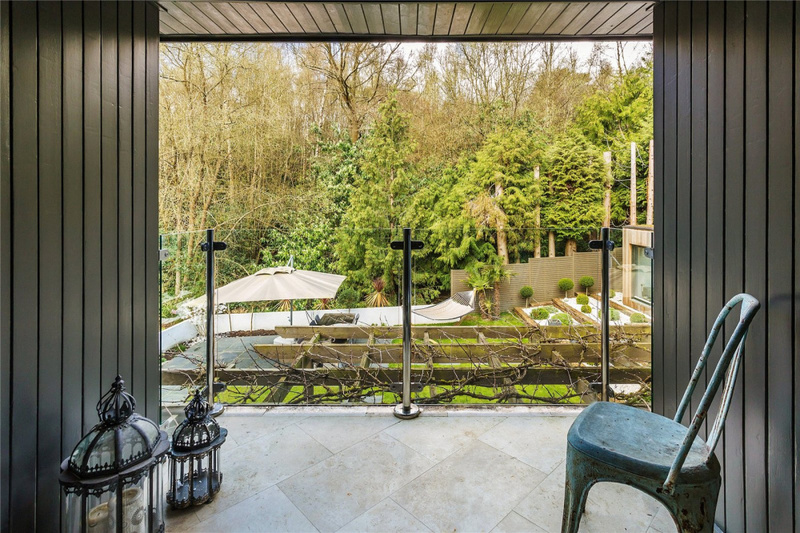 There are two sets of double opening doors that lead out onto the covered terrace at the side of the house which looks out over the lower part of the garden. 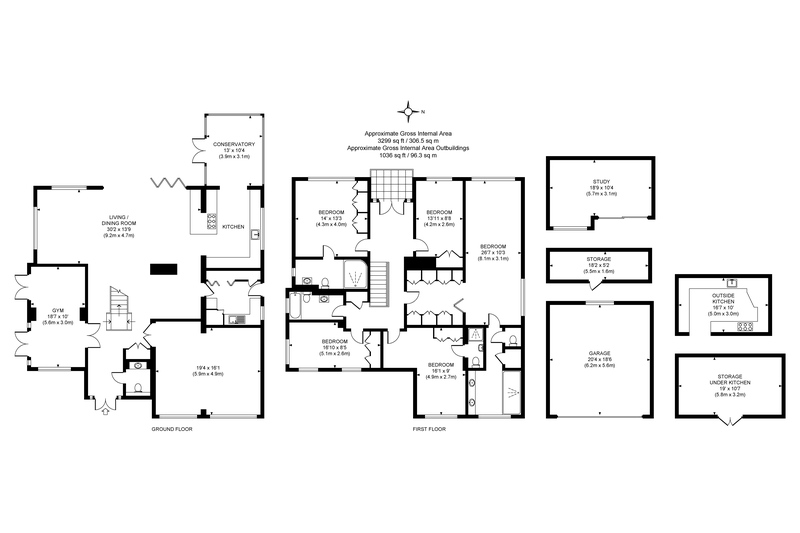 This work can be finished or stopped if not required. 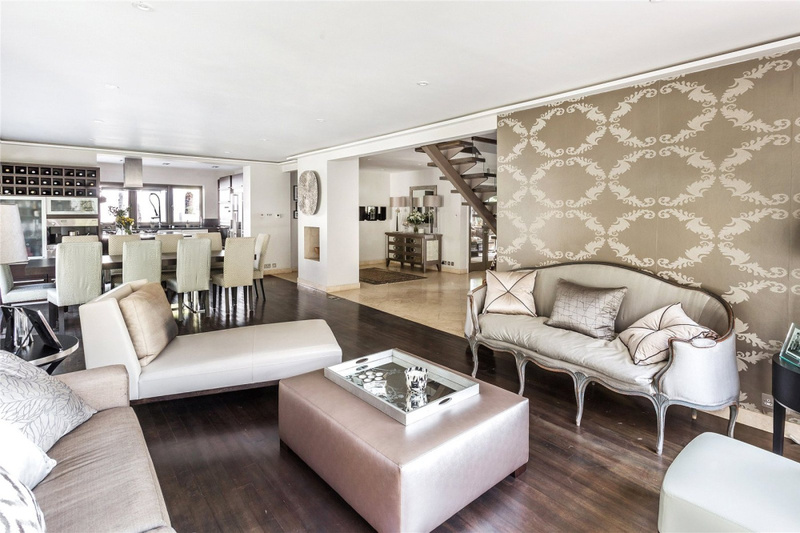 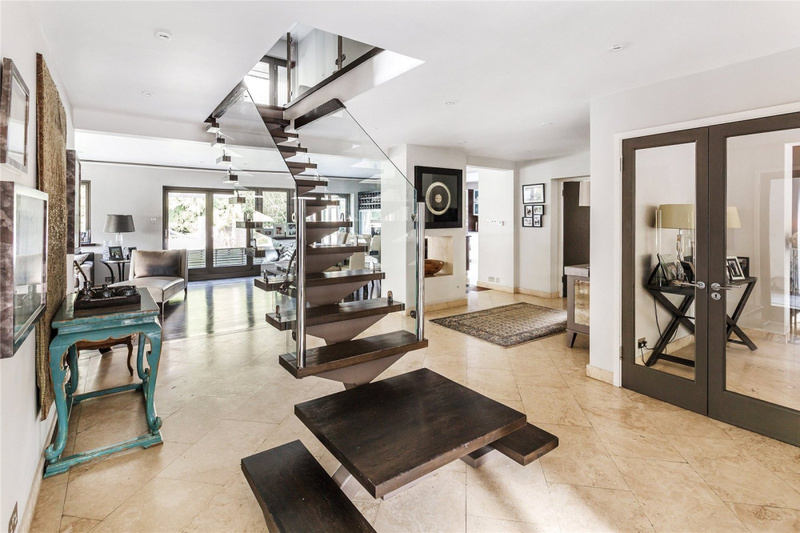 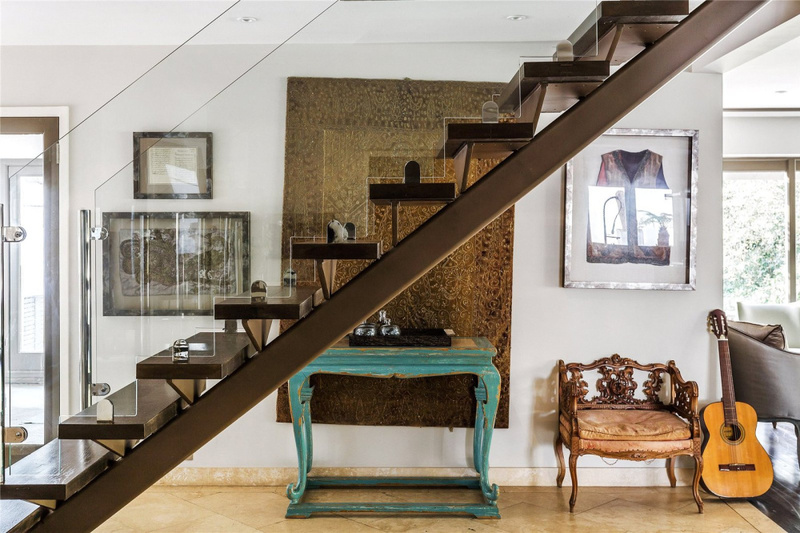 The upstairs layout of this house is exceptional. 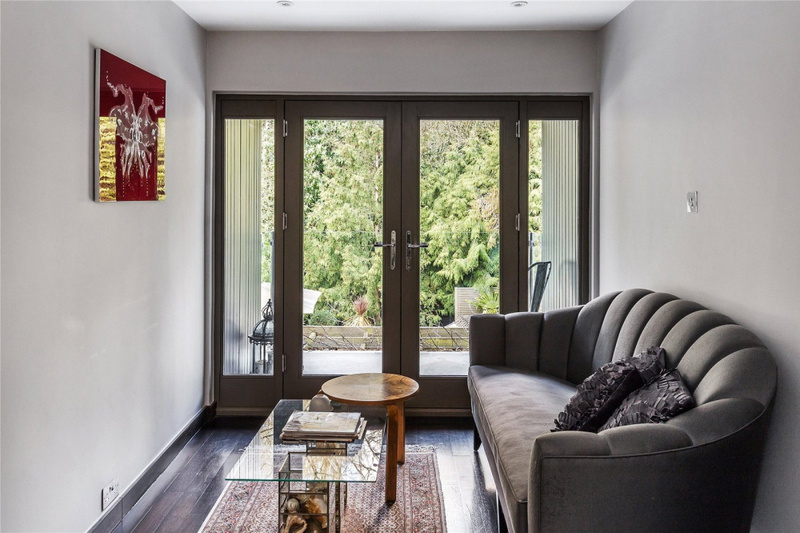 The landing is a bright and airy space which has room for a table and sofa and there is a set of doors which leads directly out to a covered balcony overlooking the garden which is a delightful place in the morning or evening, in rain or shine soaking in the delightful views. 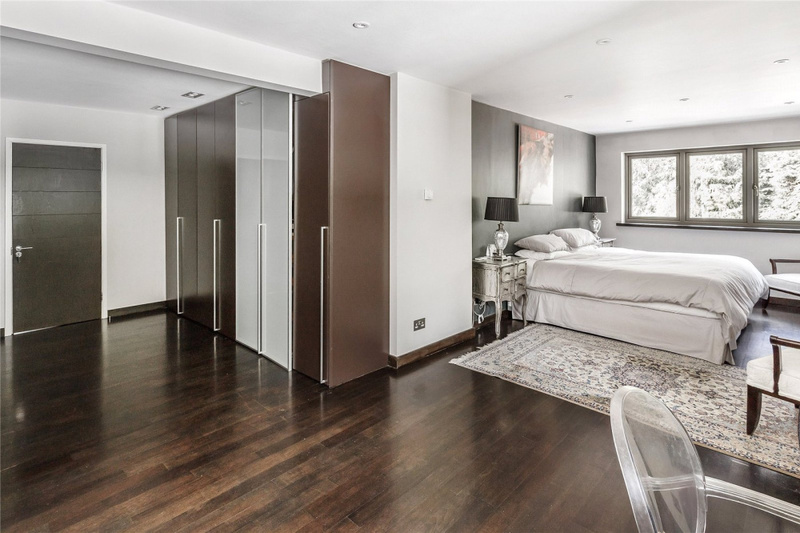 The master suite is a selfishly large space complete with a dressing areas with extensive his and hers wardrobes and luxury en suite with double width walk in shower and his and her sinks. 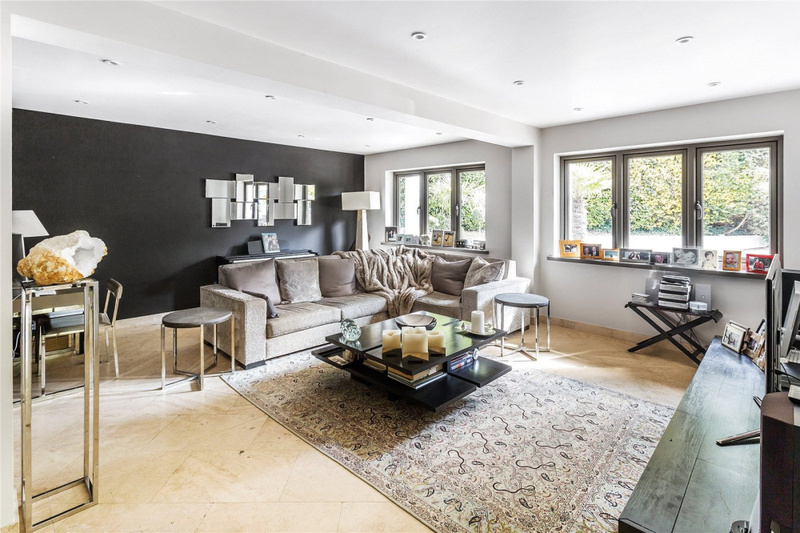 There is also the added benefit here of air conditioning and double aspect windows offering views of the rear and side gardens. 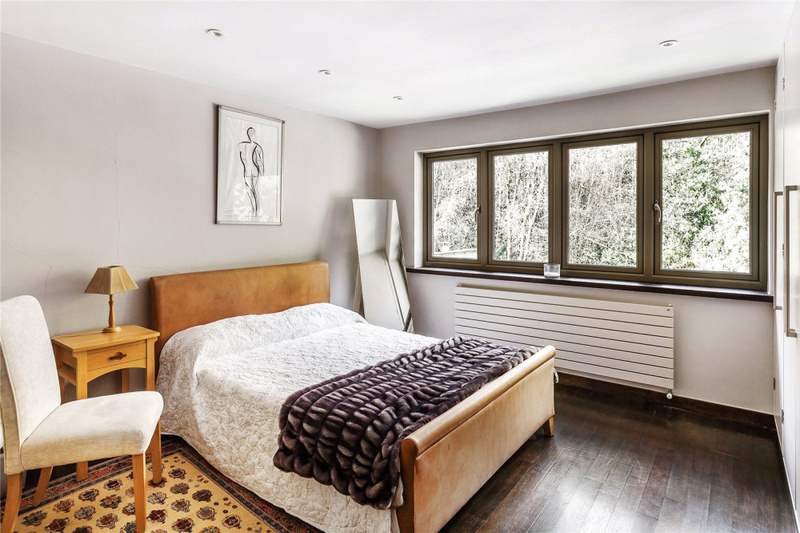 Bedroom two and three are large double rooms have their en suite showers one of which is a great size walk in and sit down stream room. 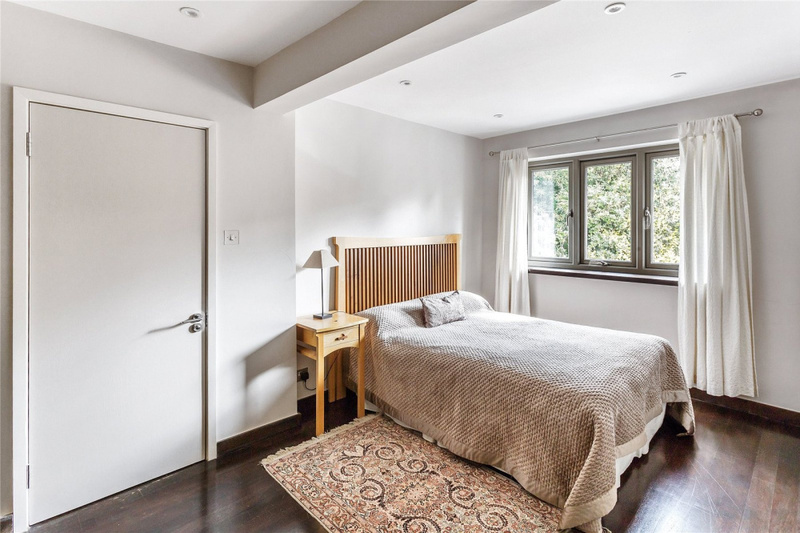 Bedroom four and five are also double bedrooms, both have built in wardrobes and share the use of the family bathroom. 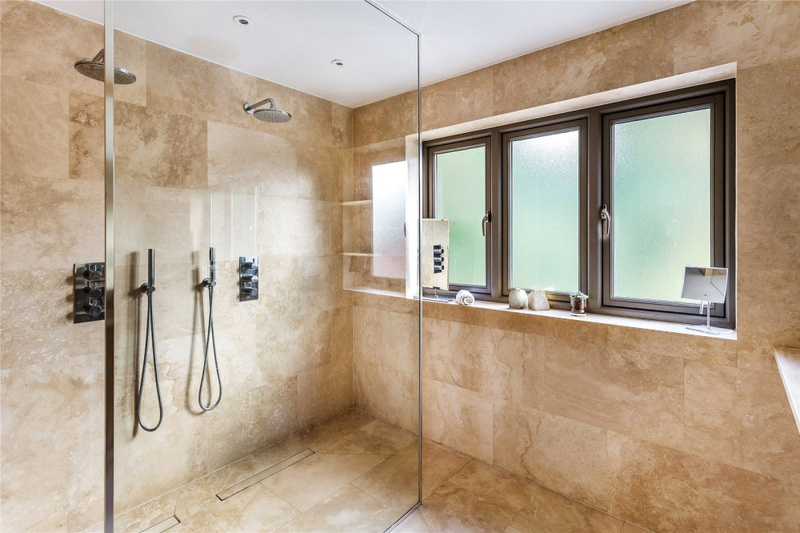 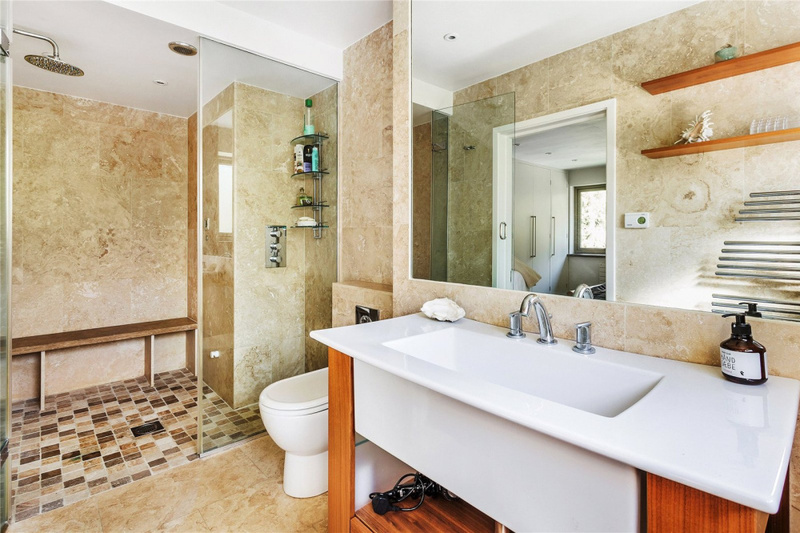 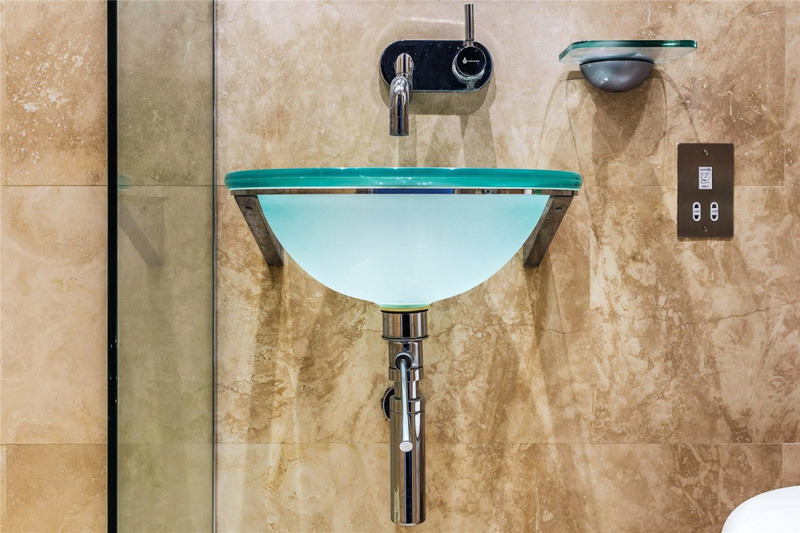 All bath and shower rooms are fitted with very high end sanitary ware and marble tiles complete with underfloor heating. 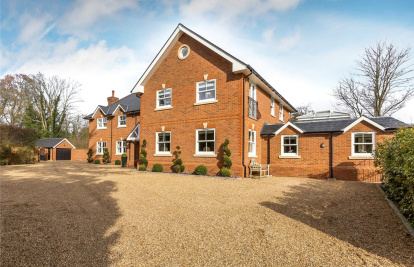 At the front of the property there is a large driveway that allows for the off road parking of numerous cars and which leads to a detached double width garage with a large store room beneath. 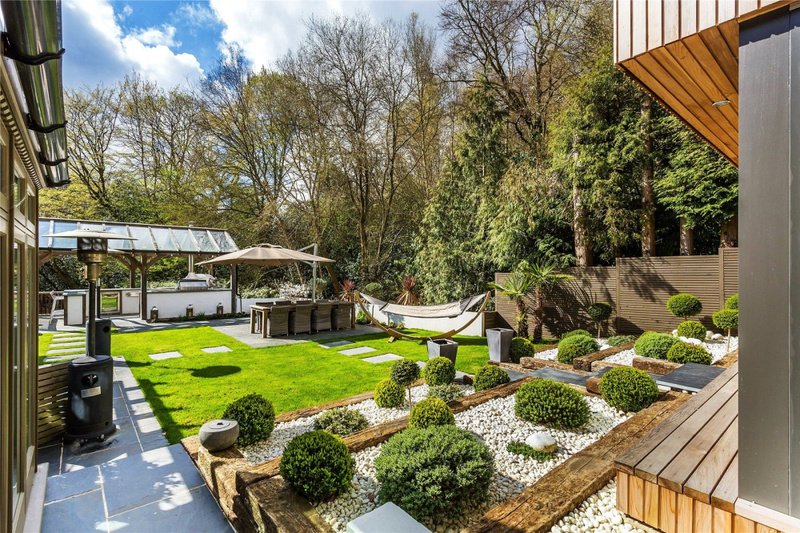 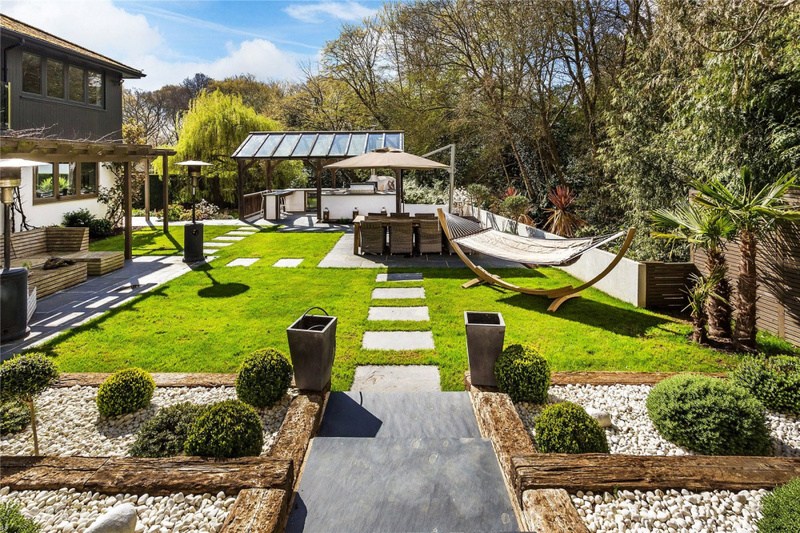 As with the house, the garden has been landscaped with huge imagination and thought and is very much part of what makes this such an exceptional home. 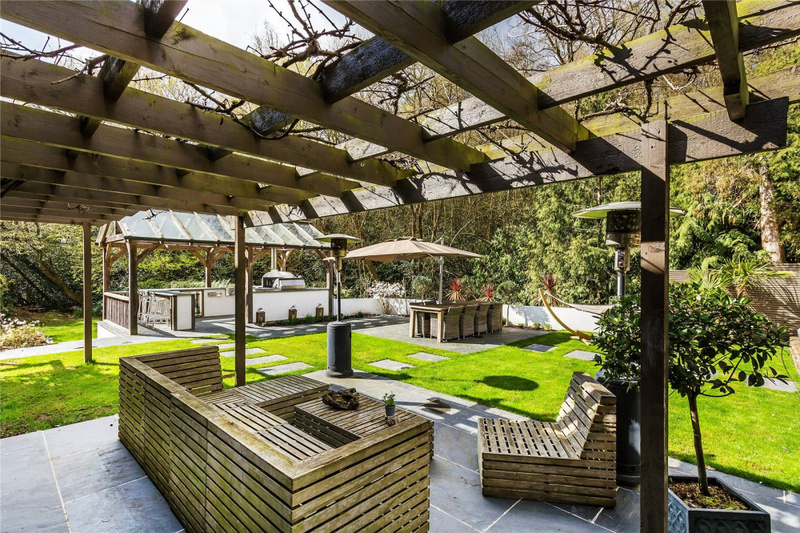 Around the back of the house there are various terrace areas which wrap around from the side to rear enjoying a sunny south and west aspect. 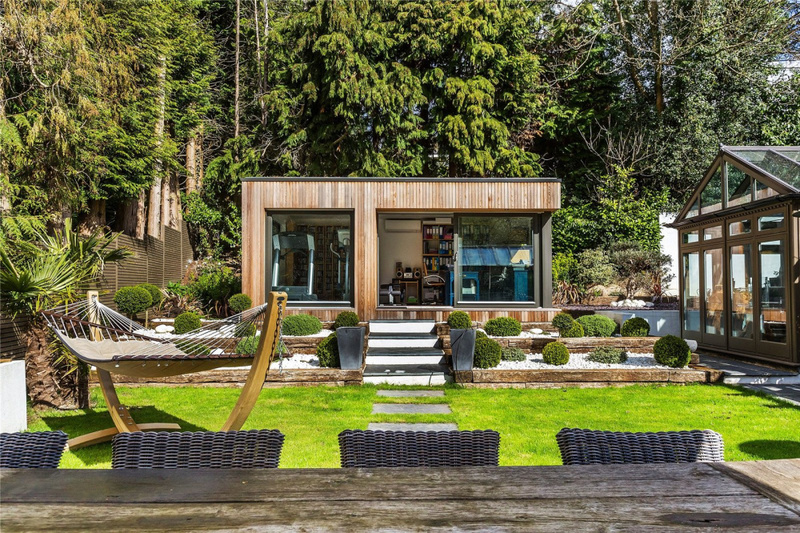 A recent edition at cost of Circa £60k is a stunning Eco Cabin complete with air con and sliding doors out to the gardens. 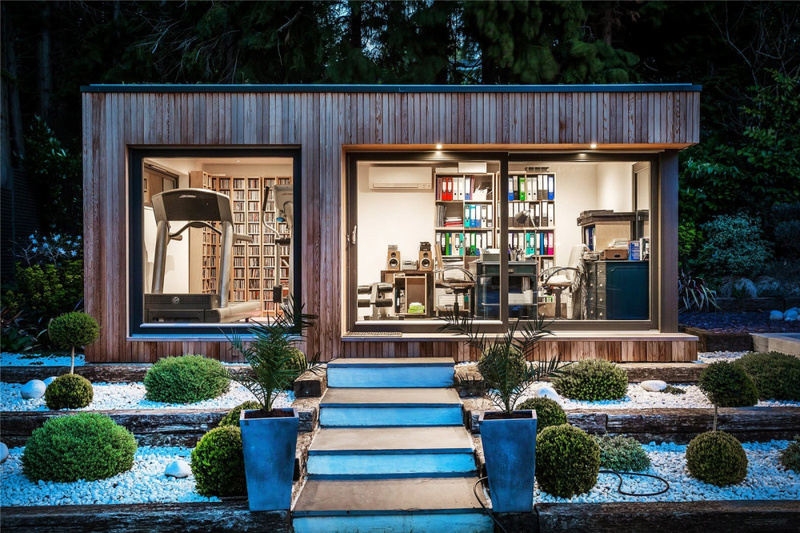 This is currently used as a gym and home office and offers and incredible retreat that is both visually pleasing and practical. 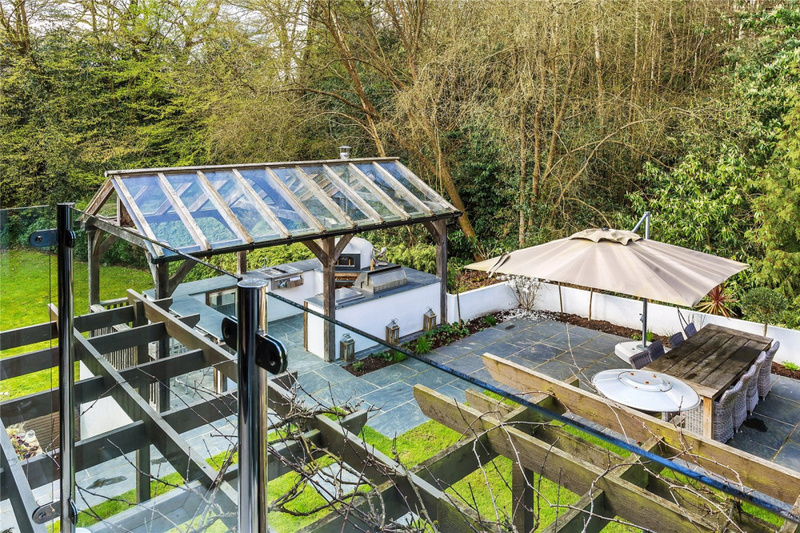 Some of this area is covered by vine clad loggias which create a wonderful spot for eating outside during the spring and the summer months. 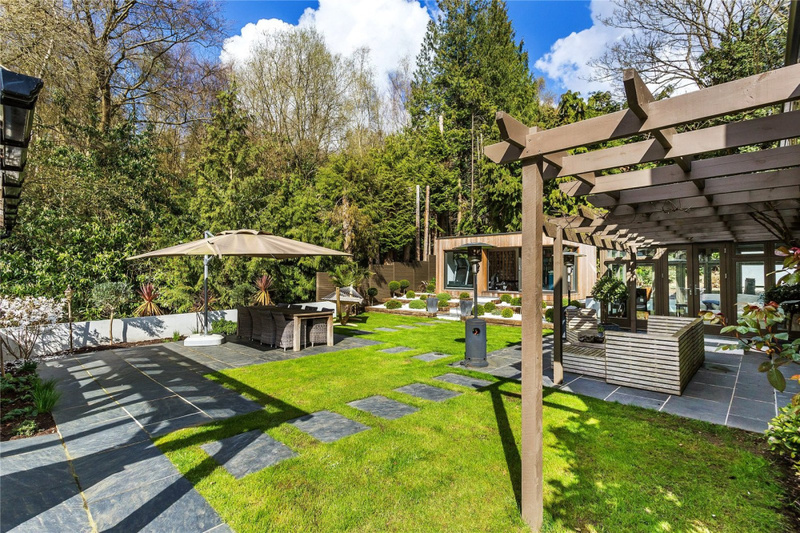 The main rear part of the garden is neatly laid to lawn with a large terrace which is ideally positioned adjacent to the outdoor kitchen. 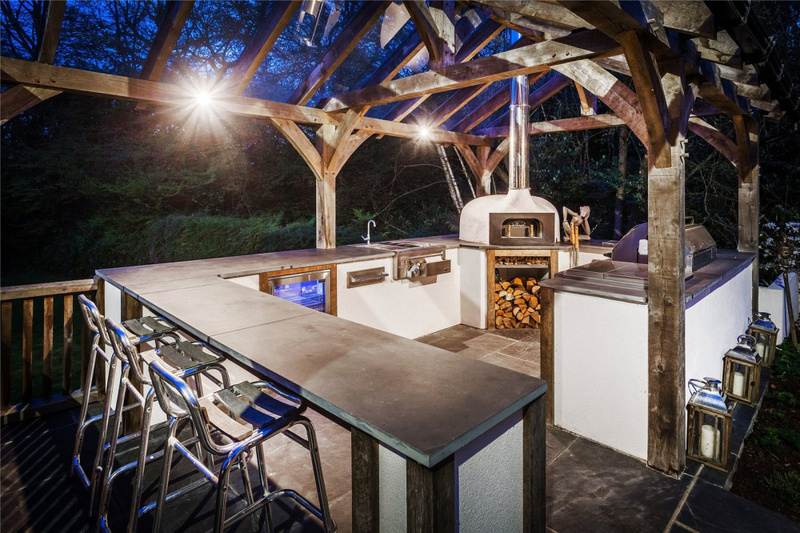 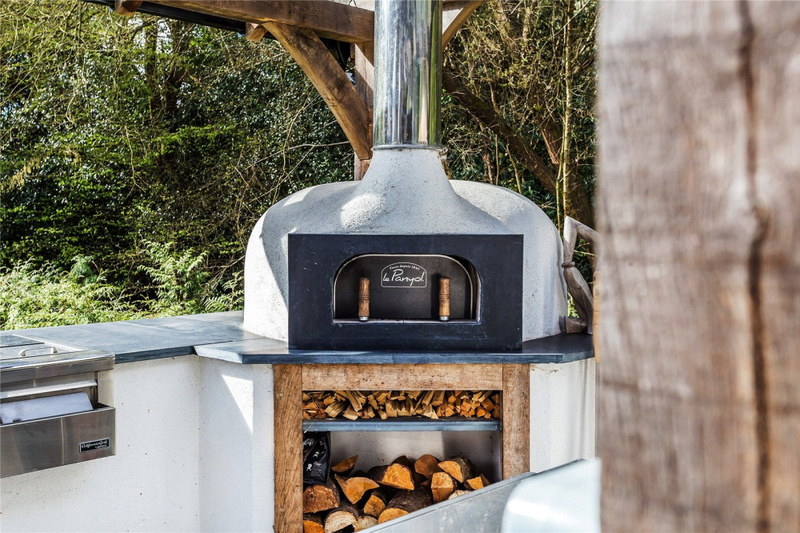 Once again this has been created with every thought given to the detail and is a superb solid oak framed structure with a glass roof, a built in barbecue, hob, pizza oven, wine fridge and beautiful slate worksurfaces. 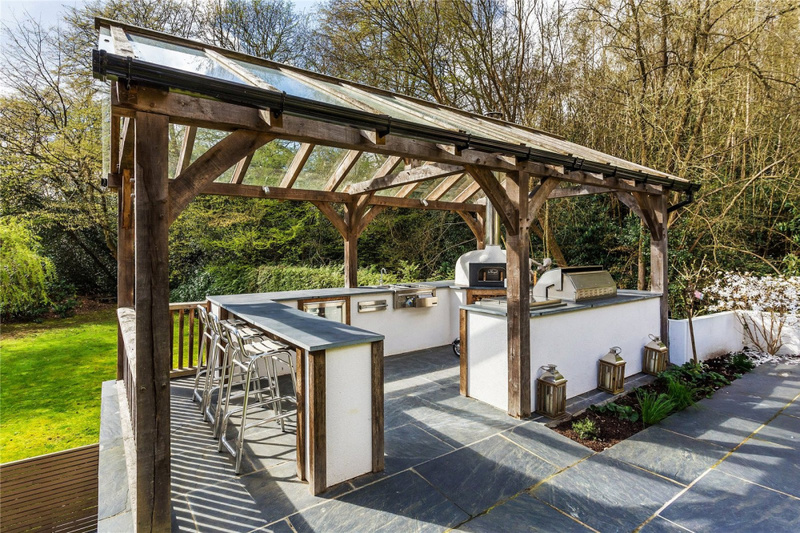 It is unusual to say the least to see an outside cooking area of this quality and it works extremely well. 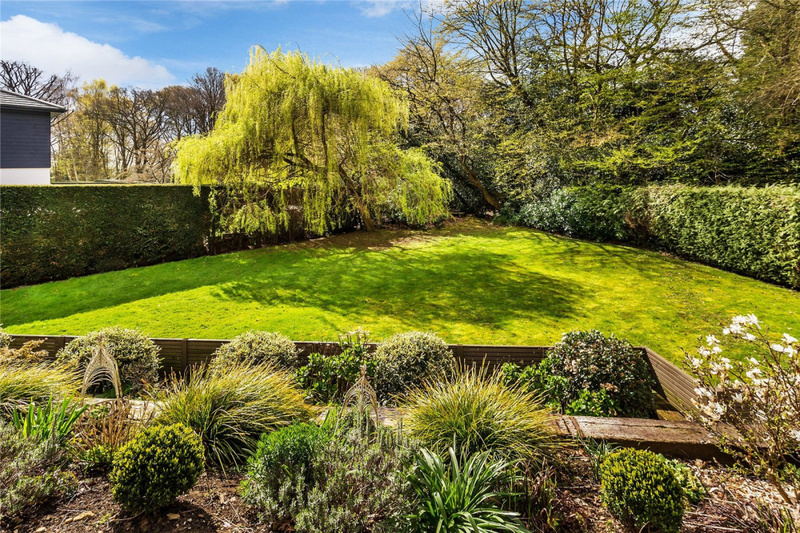 The garden back and sides on to privately owned green belt woodland and as it is set staggered away from its nearest neighbour you are completely secluded from any other property. 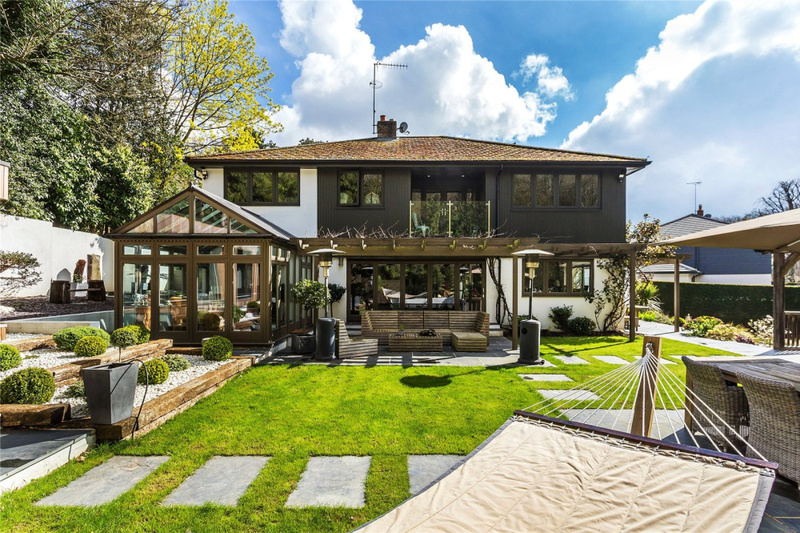 It's not often you can have a house that doesn't need any curtains at all and a garden of which you can be in any part of and not be overlooked which again add to the uniqueness on offer. 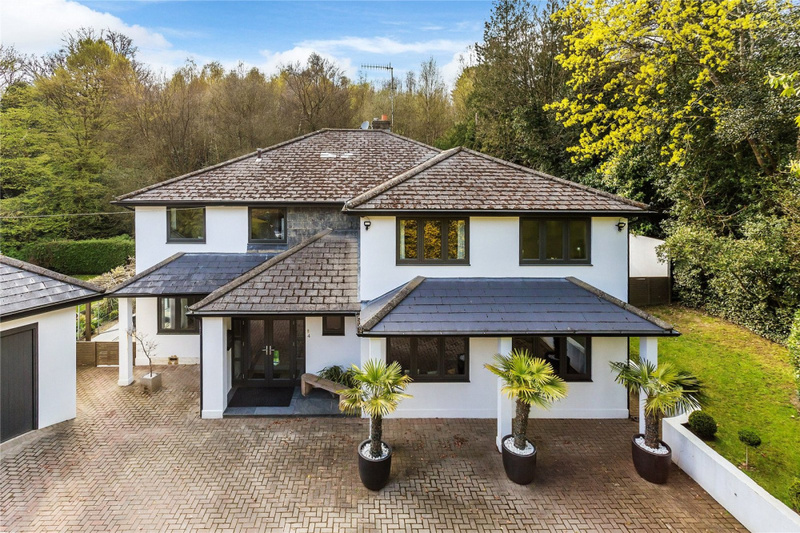 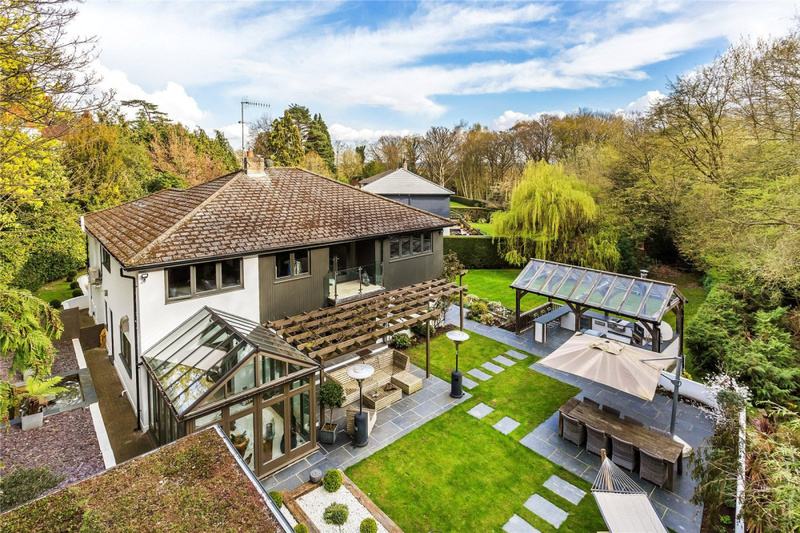 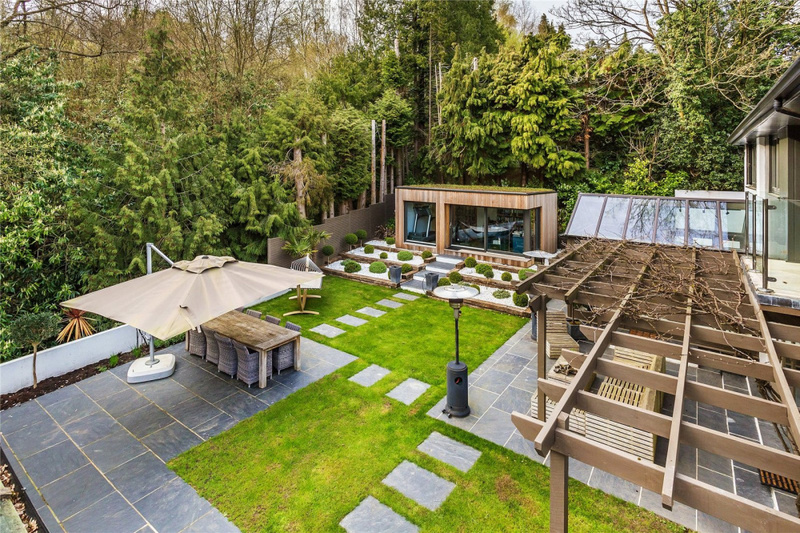 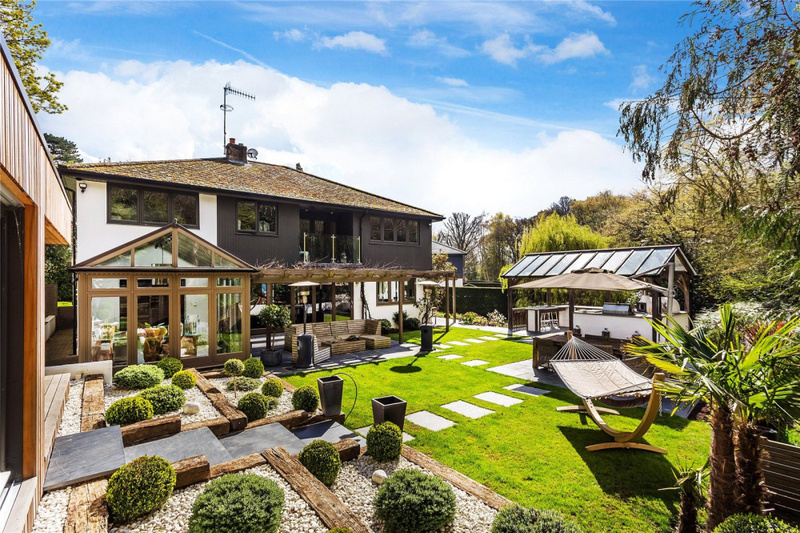 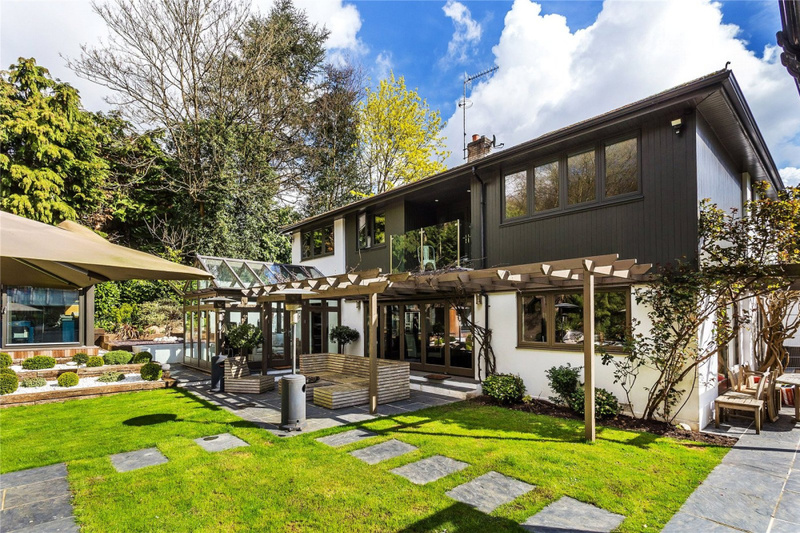 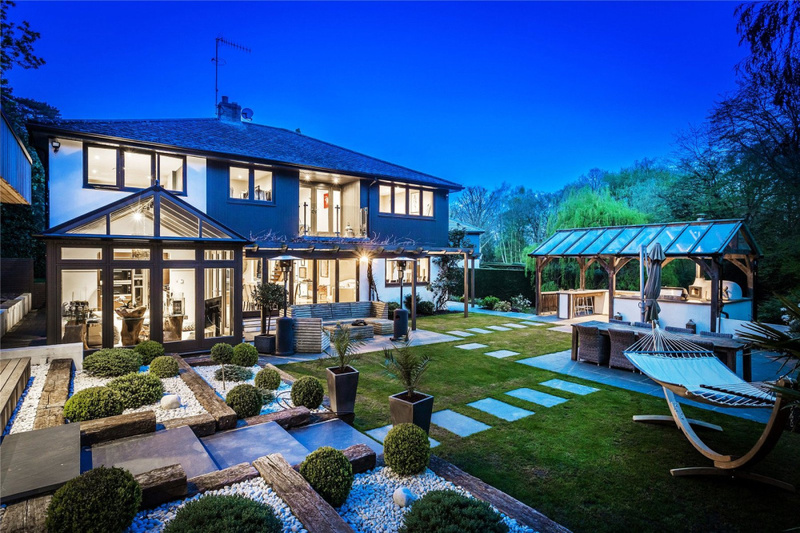 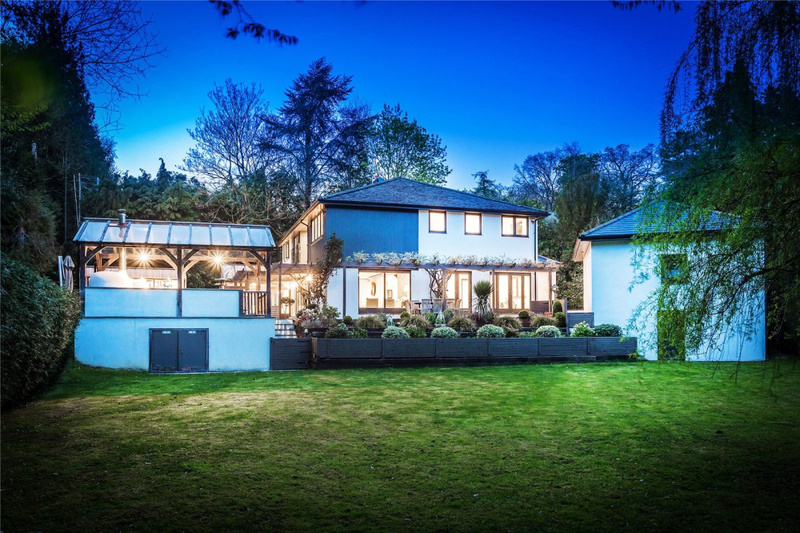 Hook Heath is without question one of the most sought after locations in Woking and Copper Beech Close is undoubtedly one of the most peaceful parts of the area. 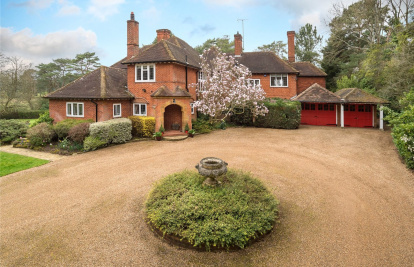 Hook Heath was first developed on heathland during the 1920s and in the main is made up of substantial family homes and converted mansion houses. 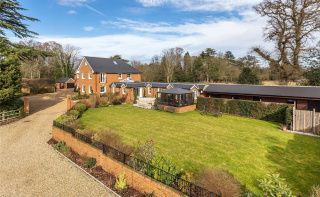 A short walk from the house is Hook Heath Tennis and Croquet club while in the immediate area there are a number of very highly regarded golf courses. 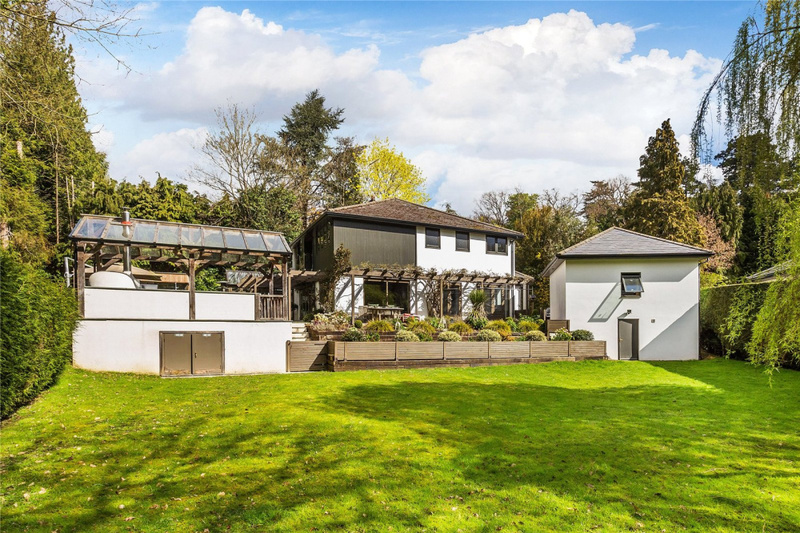 Within just a short drive is Woking town centre which continues to be the subject of very considerable investment resulting in a modern and busy cosmopolitan town that has an eclectic array of bars, cafes and restaurants. 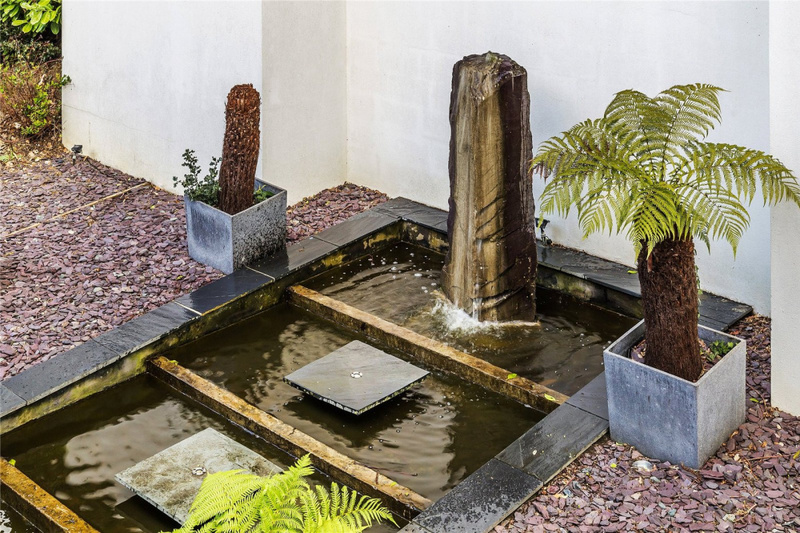 The town also has a wide variety of shops particularly in the Peacocks centre which is also home to the New Victoria theatre and multi screen cinema. 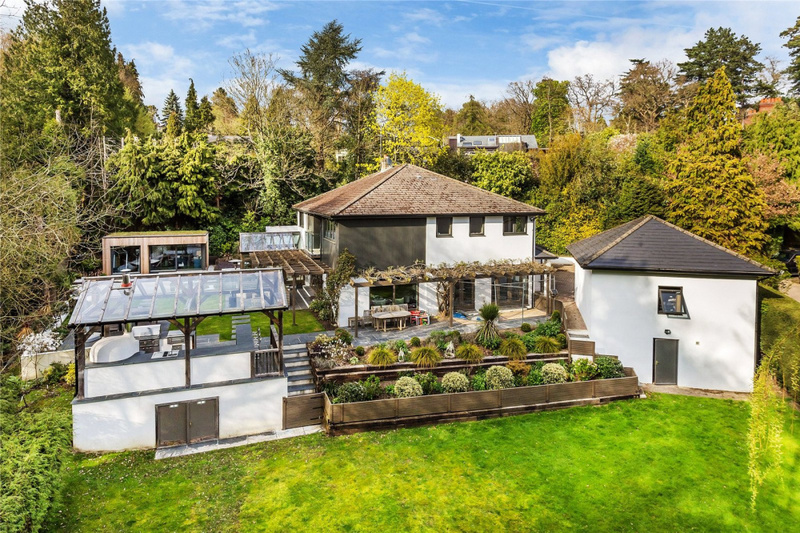 A short drive in the opposite direction will take you into the beautiful county town of Guildford with its historic cobbled high street lined with period buildings.